For Defense Secretary Jim Mattis, this week’s NATO summit presents a central test: how to preserve a U.S.-European alliance that he sees as crucial to America’s security while not crossing a boss who doesn’t share that view. The summit, which will bring Mattis and President Trump together with the traditional allies of the United States, illustrates the tightrope the former general has walked since arriving at the Pentagon. The two have differed on torture, the war in Syria and, most centrally for Mattis, the value of America’s alliances as it confronts an increasingly aggressive Russia and other threats. [post_ads]Mattis has compensated by keeping a low profile, downplaying differences with Trump and quietly urging the Europeans to judge the administration by its actions and not the president’s tweets. But in recent months, Mattis’s task has grown more arduous. Relations with Europe are at their lowest ebb in decades as allies brace for another acrimonious encounter with the president who last month harshly criticized them at the Group of Seven economic summit in Canada. Meanwhile, Trump has fired or sidelined key foreign policy advisers who share Mattis’s internationalist worldview. Recently, Trump suggested to aides that he might cut U.S. force levels in Europe if the allies do not boost spending. “They kill us with NATO,” Trump said last week at a speech in Montana. “They kill us.” He then called for better relations with Russian President Vladi­mir Putin, whom many of the NATO allies see as their greatest threat. Those statements echoed across Europe ahead of the NATO summit and set the stage for Mattis, who will have to decide how much goodwill he is willing to risk with the president as he calms allies who are beginning to wonder whether the United States is still committed to their collective defense. Pentagon spokeswoman Dana White said that Mattis has repeatedly stressed the importance of NATO while calling, as Trump has done, for greater military spending in Europe. But instead of issuing threats, Mattis has relied on rousing language, touting the importance of the alliance in combating terrorism and countering Russia. The difference in approach was starkly apparent when Germany’s defense minister visited the Pentagon last month. Mattis praised Germany’s plan to increase defense spending to 1.5 percent of GDP by 2025, a mark still well below the alliance’s 2 percent goal. Trump was less accommodating, accusing Chancellor Angela Merkel this week of exploiting the United States by underspending on defense as Germany cuts new deals with Russia for natural gas. 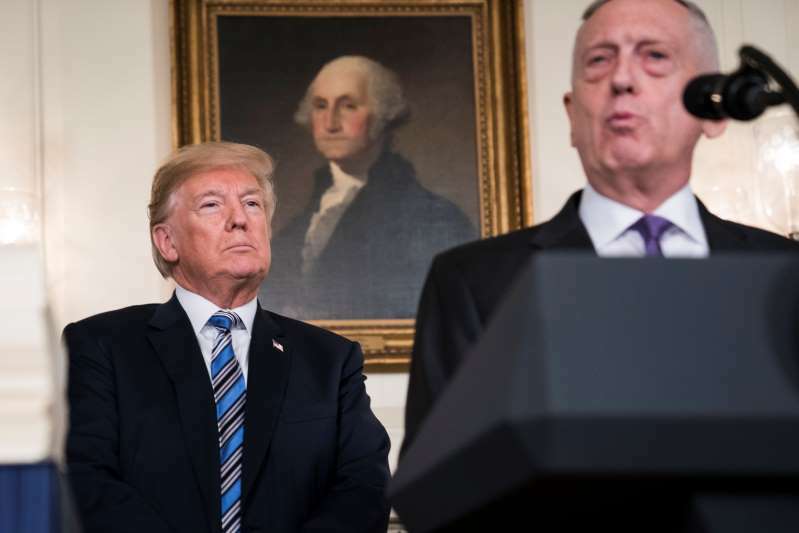 The contrasting rhetoric is indicative of the differing perspectives of Mattis, whose National Defense Strategy touts America’s alliances as the “backbone of global security,” and Trump, an America-first businessman who frequently talks about them as a drain on U.S. coffers. The two men differ even more significantly on the threat posed by a resurgent Russia, whose activities beyond its borders — in Ukraine, Syria and even Europe, including a nerve agent attack in Britain allegedly conducted by Russia — have energized NATO capitals and prompted the Pentagon to spend billions to add troops and equipment in Eastern Europe. Before his confirmation, Mattis warned of Russia’s intent to break the Atlantic alliance and use subterfuge to expand its influence in the West. Since taking office, he has described Russia as the “pacing threat” for the Pentagon — the nation that the U.S. military should be prepared in the near term to counter. His tough talk stands in contrast to that of the president, who has contradicted intelligence agencies’ conclusions about election interference and suggested he might recognize Moscow’s annexation of Crimea. Last year, Trump blindsided Mattis and the rest of his national security team when he struck language from his first NATO speech recommitting the United States to Article 5, the alliance’s bedrock principle that an attack on one is an attack on all. “He knows he can be most effective by quietly convincing the president,” he said. Much of Mattis’s work this week in Brussels will probably take place behind the scenes. The NATO summit is set up to amplify the voice of the U.S. president, and Trump’s speech before the allies will probably be the centerpiece of the gathering. Mattis will almost certainly be at his side for it. If Trump seeks to roil allies, the defense secretary will have to rely on private conversations over lunches, dinners and coffee breaks to soothe them. Lately, questions have been swirling about Mattis’s influence with Trump. Trump has called for the creation of a “Space Force,” which Mattis opposed, and promised to pull U.S. forces from Syria “very soon,” against the advice of his generals. In his whirlwind summit with North Korean leader Kim Jong Un last month, Trump promised to halt military exercises with the South. While the president and Mattis had discussed calling off exercises beforehand, Trump made his final decision without consulting his defense secretary, who did not attend the talks. Staff shake-ups, meanwhile, have left Mattis with fewer close allies. Mattis had a tight bond with Rex Tillerson, who was fired earlier this year as secretary of state. White House Chief of Staff John F. Kelly, a retired Marine and decades-old friend, has seen his influence wane amid reports that he could be departing this summer.